The next phase of Destiny 2 starts next week on Tuesday, November 27 with the Season of the Forge, followed by the release of The Black Armory DLC the week after. The Black Armory is loaded with new guns to collect, and per Bungie's latest This Week At Bungie blog post, the Season of the Forge has some new weapons of its own in the form of pinnacle weapons for Vanguard, Gambit, and Crucible activities. Players have been asking for pinnacle weapons like the Luna's Howl handcannon available in Crucible to be added to PvE activities for some time, and they're finally getting their wish. Not only that, all three weapons look to be pretty darn powerful, as all of them have unique weapon perks. The Vanguard pinnacle weapon is the Loaded Question energy (arc) fusion rifle. Its unique perk, Reservoir Burst, deals additional damage and causes enemies to explode when the battery (ie the magazine) is full. To obtain it, you'll need to rack up 500 fusion rifle kills and 1,000 arc kills in Strikes, and complete 40 Strikes. Gambit's pinnacle weapon is Breakneck, a kinetic auto rifle. Its unique perk, Onslaught, increases its rate of fire as you build stacks of Rampage. So the more dudes you kill, the faster you'll shoot, which sounds very potent. To earn Breakneck, you'll need to get 500 auto rifle kills, 100 auto rifle multikills, and 150 challenging enemy kills in Gambit. You'll also need to complete 40 Gambit matches. Finally, we have the new Crucible pinnacle weapon. 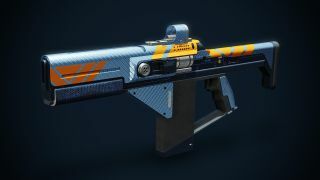 Replacing Luna's Howl is the kinetic grenade launcher The Mountaintop, with the unique perk Micro-Missile that causes grenades to travel in a straight line at greatly increased speeds. Its grenades also detonate on contact, whereas most grenade launcher rounds tend to ricochet unhelpfully into the next hemisphere over. The quest for The Mountaintop is more difficult, and requires earning grenade launcher kills, multikills, and trajectory medals in the Crucible. You'll earn more points in the competitive playlist, which you might as well play since you'll need to reach Fabled Glory rank to finish the quest. Mercifully, the quest for The Mountaintop is account-wide, though it sounds like Loaded Question and Breakneck are character-specific. The quests for all three weapons will become available on Tuesday, November 27. You can get another fabulous weapon in under an hour with the help of our Destiny 2 Thunderlord quest guide.